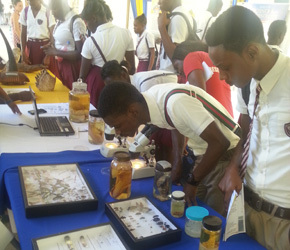 The Faculty of Science and Technology has a very active Outreach and Development programme where students from all age groups are engaged in scientific activities and career talks which spark their interest and excitement. This is achieved by demonstrating the purpose, usefulness and applications of science in the home and the wider society. These students are exposed to the research, innovation and development undertaken by the Faculty of Science and Technology in making life easier which contributes to the overall development of our country. 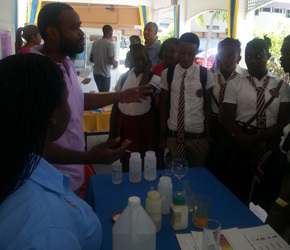 The outreach team headed by Dr. Winklet Gallimore plan and execute these activities through school visits, science fairs, and workshops, including other activities planned in collaboration with the Marketing, Recruitment and Communications office, UWI Mona. Persons are asked to indicate interest in participating as early as possible, as space is limited. 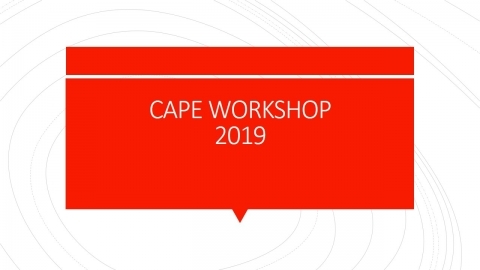 Visit the registration webpage, https://www.mona.uwi.edu/fst/capeworkshop, complete and submit the online registration form for your subject area of interest. Kindly allow 24 hours to receive confirmation of your booking. Space availability information for each workshop is available on the respective department pages. A team of 50 plus representatives of the Faculty of Science and Technology (FST) were mobilised to assist in beach clean-up activities led by the National Environment and Planning Agency (NEPA). The annual clean-up takes place along the Palisadoes strip in light of International Coastal Cleanup (ICC) Day - one of the world's largest events and volunteer efforts designed to preserve and protect our coastal bodies. 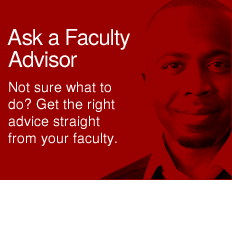 The activity is an annual item on the faculty's Outreach Programme calendar of events which has had a promising show of support from students and staff over the years. 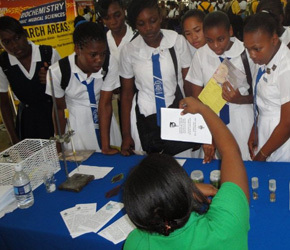 The outreach team has visited several high schools in Jamaica in an effort to recruit prospective students in the Faculty of Science and Technology. 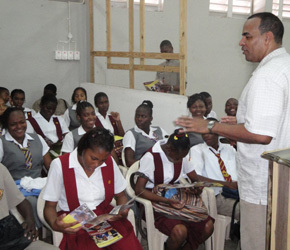 These visits to selected High Schools across the island are coordinated by the Marketing, Recruitment and Communications office, UWI Mona. 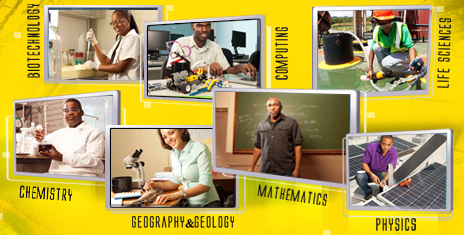 During school visits students are provided with information about the different programmes and courses that are offered by the UWI and, in particular, the Faculty of Science and Technology. They are also engaged in interactive displays in science that will stimulate an interest in the area. A group of students from three schools in the parish (approximately 25 students) were given tours of the Farm, a relatively new attraction to the parish. The Faculty of Science and Technology presented an interactive display for the students to view specimens of plants and animals from the marine and freshwater environments, check the pH of the River Bumpkin water and guess the pH of selected solutions. The effects of climate change on the environment were highlighted. Tissue culture plantlets displayed the work of the Biotechnology Centre and its potential for Cockpit Country conservation efforts was discussed. Students were given tokens (small glassware items) for correctly answering questions related to science. The Faculty of Science and Technology participated in the Exhibition entitled “Science in the Park”. 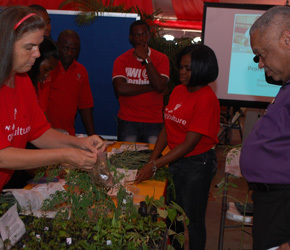 The event was coordinated by the Scientific Research Council and held at Emancipation Park. 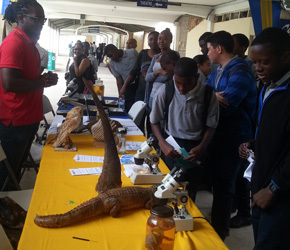 Several schools from across Jamaica were in attendance and it was an appropriate venue for the Faculty to showcase its different programmes and research. 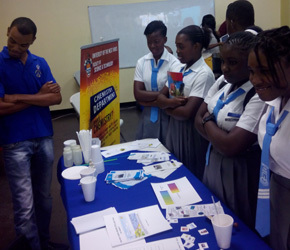 A member from the Marketing, Recruitment and Communications Office was also in attendance, who provided information about the UWI programmes and offerings. 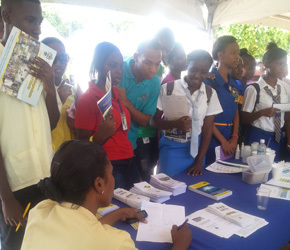 The outreach to the Western Jamaica Campus (WJC) was a University activity with representation from all the faculties as well as other entities within the UWI Mona community. Representatives from each department within the Faculty of Science and Technology namely: Biotechnology Centre, Chemistry, Computing, Geography & Geology, Life Sciences (through the Discovery Bay Marine Laboratory), Mathematics, Mona School of Engineering, and Physics participated in this initiative. The Departments engaged the students in interactive displays, provided information about programmes offerings by the faculty and possible career options. The Departments of Mathematics and Physics held workshop sessions where several students participated and were well captivated in what was being taught. 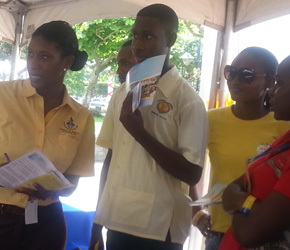 Activities were undertaken in the tent as well as on the Faculty spine. Displays on the spine were presented by the Biotechnology Centre, Departments of Chemistry, Life Sciences, Mathematics, Physics and the Mona School of Engineering. 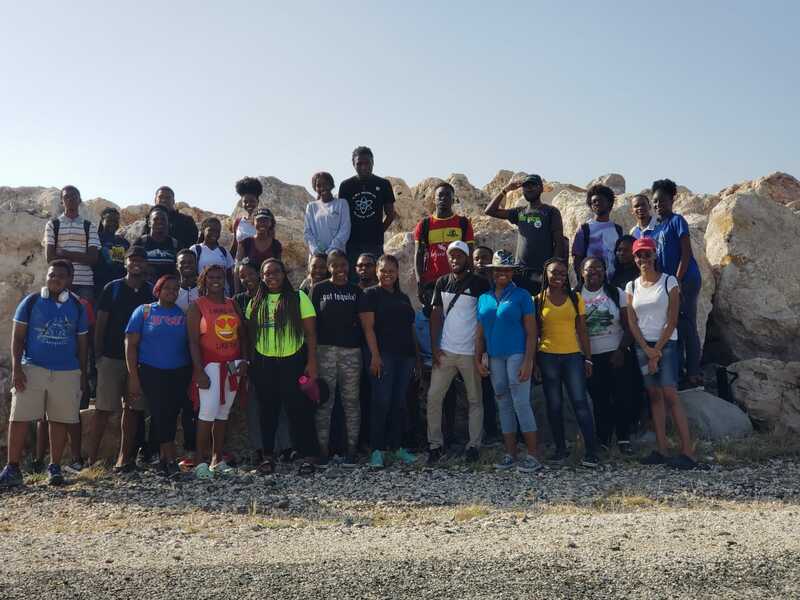 The Geography & Geology Department hosted students in the museum where they were exposed to the different types of rocks and minerals, while the Earthquake Unit facilitated tours. The Biotechnology Centre presented samples of Moringa balls and a yam-based product for evaluation. The Chemistry Department, in collaboration with the Chemical Society, conducted several experiments and coordinated the sampling of ice cream and cassava bread. 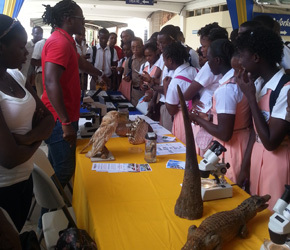 Life Sciences displayed a variety of preserved specimens which were of interest to the students, for example, the lion fish which is an invasive species. The Department of Mathematics collaborated with the Actuarial Society to present interesting puzzles, quizzes and information to participants. 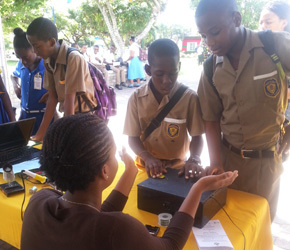 The Department of Physics was represented by the Electronics Club with gadgets made by its members, while the School of Engineering displayed architectural models, one of which is the projected view of the Kingston Waterfront. The FST also participated in the annual Denbigh Agricultural Show. 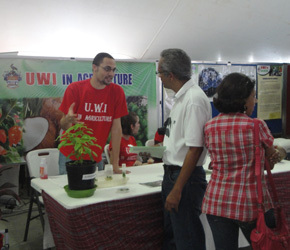 The UWI used this opportunity to showcase its relevance to agriculture under our theme "UWI in Agriculture: Food Security and Climate Change", highlighting its national contributions via displays in research, product development and service. 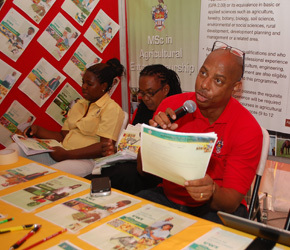 All participating Departments, Centres and Units mounted an impressive array of posters and interactive displays, and had readily available information on the offerings of the faculty, focussing especially on the Agriculture Entrepreneurial Programme. 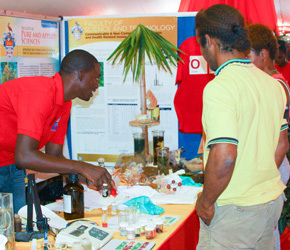 The other themes were "Animal Feed, Fertilizers and Insecticides" (Department of Chemistry); "The Moringa Magic: exploring the Moringa plant’s nutritional and medicinal potential" (Biotechnology Centre); "Shoreline Mitigation" (Centre for Marine Sciences); "The Smart House" which highlighted the potential for a non-grid connected home/frame base that can be set up at any convenient location with relative ease (Department of Physics); "Hydroponics Systems: an important technological step in the field of Agriculture" which showed the remote monitoring of crops (Mona School of Engineering in collaboration with the Department of Physics); display of aquariums and pest/natural enemy complex associated with a vegetable cropping system (Department of Life Sciences). 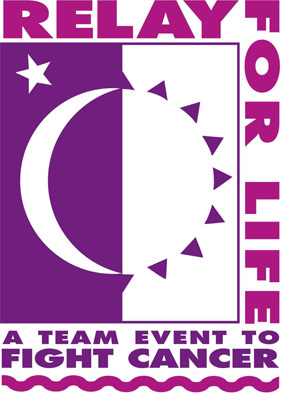 The Faculty participated in the annual "Relay for Life" event. The focus by the FST team for this year was Breast Cancer. The programme was coordinated to support the work of the Jamaica Cancer Society in its effort to raise funds to eliminate cancer as a major health problem in Jamaica. Some of the departments within the faculty are involved in cancer research in some way, from the discovery of molecules for treating cancer to the detection of the disease in humans. 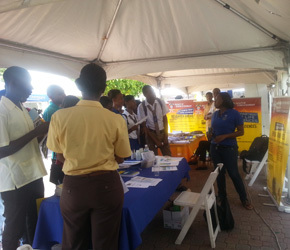 The booth provided such information and had displays that afforded an excellent opportunity for interaction with the public, educating them about various aspects of the Sciences and Cancer Research. 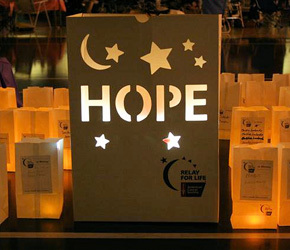 The event represented a collaborative effort from personnel from all the departments who participated by raising funds, manning the booth and relaying at the event.